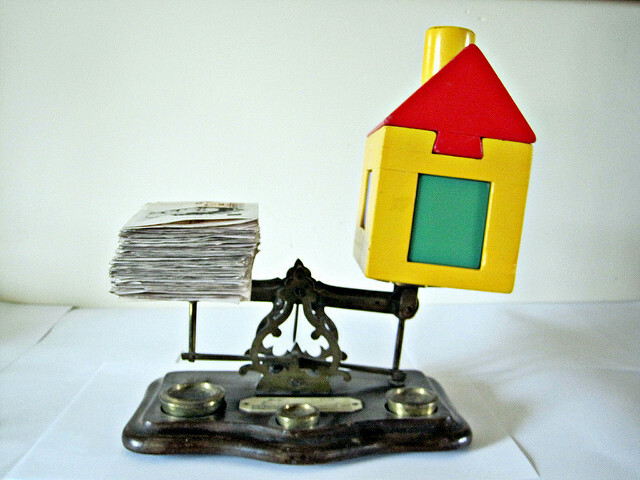 Do you own a house with a medium-small mortgage or even no mortgage? Are you also committed to investing a set amount into a dividend-paying portfolio every month? If so, there may be a way you could increase your investment outcomes without any further outgoings. Warren Buffett famously said investing is "like a snowball. The important thing is finding wet snow and a really long hill". Finding wet snow (i.e. good investments) is what the rest of our website is about. 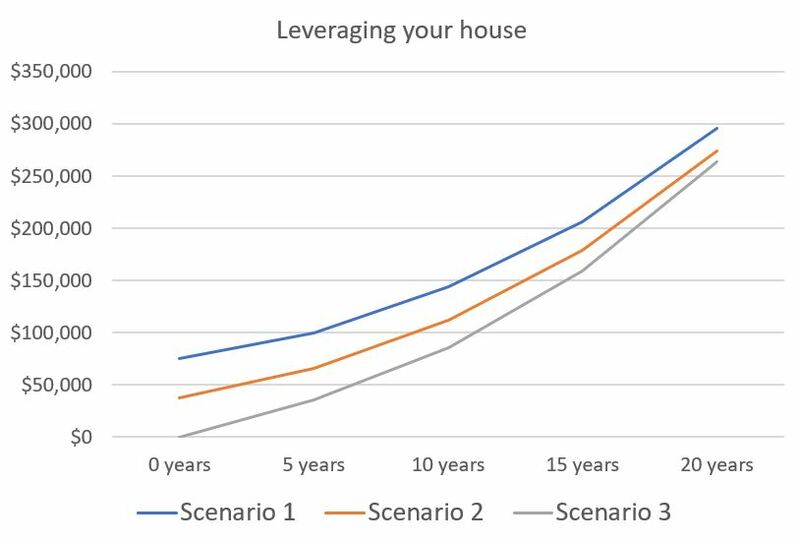 If you leverage your house for investment, you can have your money in the market for longer, in other words you're using the longest possible hill. Let's say you're committed for the next 20 years to investing $500 per month from your salary into your retirement fund and you have a $200,000 20-year mortgage on a house you own, which is worth $400,000. 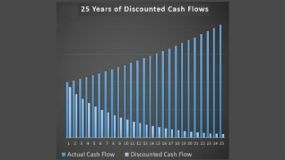 Given that you've committed to investing your $500 per month until you retire and would otherwise invest this month-by-month, I'm going to look at whether it would be better to withdraw equity from your house (via a larger mortgage) and invest, then cover the additional mortgage repayments using part or all of the $500 you've committed to investing? 1. Your job is extremely secure - losing your job with this investment structure would mean having no salary and a larger mortgage to pay - in other words: big trouble. 2. Your home is really worth the amount you believe it to be - if you were to increase your loan to say $275,000 and find out the house is only worth $300,000 (and this really can happen, see here for proof!) you're then very close to a negative equity situation which could lead to you losing the house. 3. 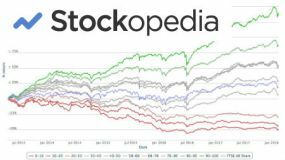 The market is not in the dying days of a long bull market, meaning you'd likely buy overpriced stocks. In short, to leverage your house in the pursuit of greater returns is not a strategy to be taken lightly. Going all in - Instead of investing $500 per month into stocks, you add $500 to your monthly mortgage payment, releasing $75,000 of equity from the house and invest it immediately. A half-and-half approach - You decide to split your $500 investment per month, adding $250 to your mortgage payment, releasing $37,500 and investing it immediately, and then investing the remaining $250 per month. 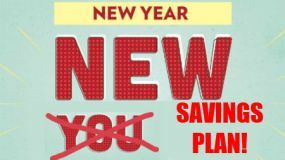 No change - you invest your $500 each month and do not increase your mortgage at all. This is our control. The first thing to say is that your mortgage will be paid off at the same time, regardless which scenario you follow; it's still at 20-year mortgage, and if you do leverage your house, you increase your payments accordingly. The value of the investments you'll have in addition to the house after 20 years, however, will be different because with low interest rates, the market will produce greater returns (especially with all dividends reinvested) than the cost of borrowing over a 20-year period. 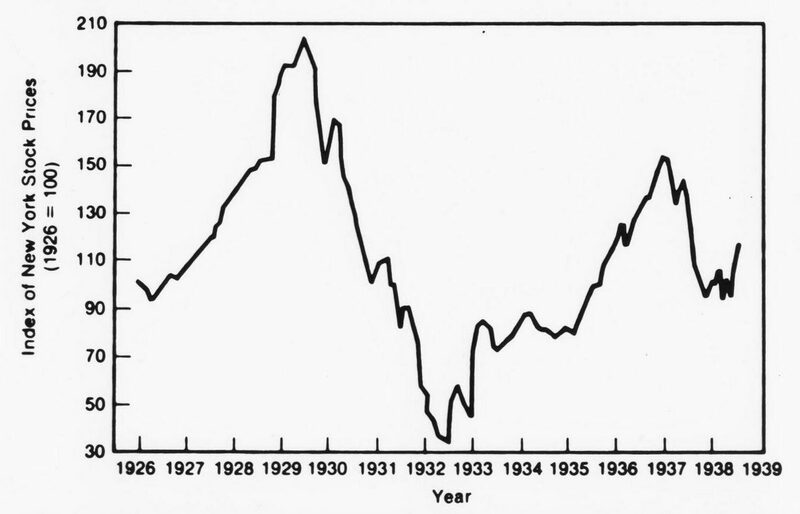 As your house is potentially on the line, you need to make extremely risk-averse investments, so to calculate the potential benefits of the investment, I have taken the most predictable investment I have in my portfolio as an example, the State Street SPDR US Dividend Aristocrat ETF whose graph (below) shows incremental, reliable capital growth of 8.38% over the last 5 years and paid a dividend of 2.27%. Bearing in mind that the last 5 years have been good for stocks in the US, I'm going to base my first calculations on a total return (i.e. with dividends reinvested) of 7.5% which I hope is a realistic low-end estimate of the return over time, encompassing growth and recession periods. So, there is clearly an advantage if you leverage your house. Investing a lump sum upfront (Scenario 1) makes a 12% ($35,520) difference in final outcome over the most conservative strategy (Scenario 3). It would be more if you can get a higher rate of return, but on balance these returns seem unrealistic and chasing such a return could prove dangerous. The difference would also be greater if you have a more valuable home and therefore could release more equity to invest in the first year, or if you have longer to go until retirement and could keep the investments in the market for say 30 years. Beyond that there may be tax savings if you live in a jurisdiction where mortgage payments are tax deductible. However, you would have to be able to invest in a tax efficient way via an IRA (US) or ISA (UK). In Australia, the picture is even better: you can also take advantage of this structure suggested by Aussie investing guru Peter Thornhill. Whether you believe this is a sensible strategy depends on the security of your job and your confidence in the valuation of your home. In the US you would use an "all-in-one home loan". In the UK this is known as an "offset mortgage". These allow you to have the extra equity you release sit in a savings account until it is needed, and you only pay interest on the full amount of your mortgage less the amount in the savings account. This has the advantage that the cash is immediately available, but you effectively do not pay interest on it until you invest. The downside of an offset mortgage is that the rates are usually higher. An alternative would be to simply take a larger principal loan either when you first take the mortgage or when you refinance and to invest the surplus. Any transaction such as this where you are investing a large sum represents a risk because you could enter the market at the wrong time. 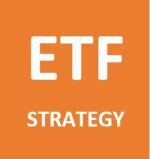 Because of this, dividing your investment and purchasing your chosen stocks / ETFs via in chunks each month will offer some security (known as dollar-cost-averaging). This will effectively smooth any fluctuations in the market and give you the average price over the period. The longer the period, the less the risk.